I never make Christmas cookies. Don’t get me wrong, I love to eat them; baking just isn’t my thing. Instead, I make my own Christmas cards and wrapping paper every year. Personalized wrapping paper is not only less expensive but each gift becomes a little work of art, an original design by you! 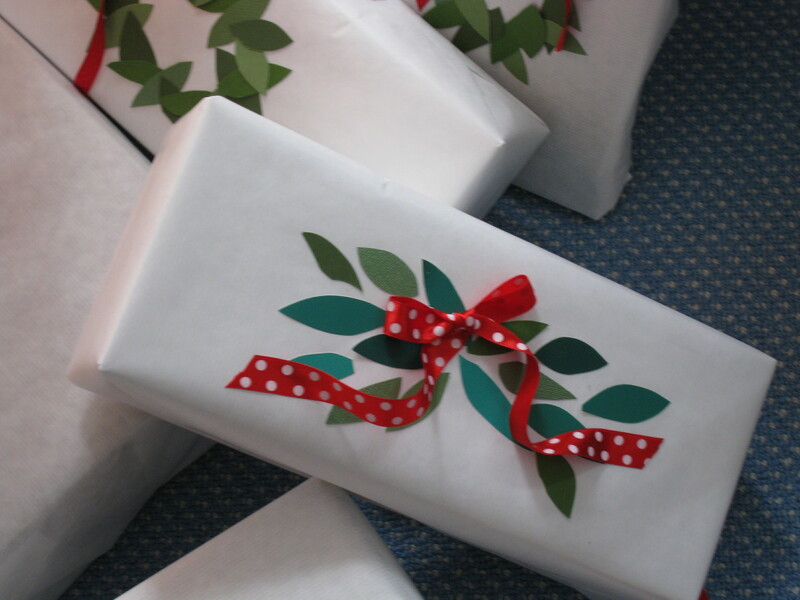 You can even coordinate your gift wrap with the interior design of your living room. 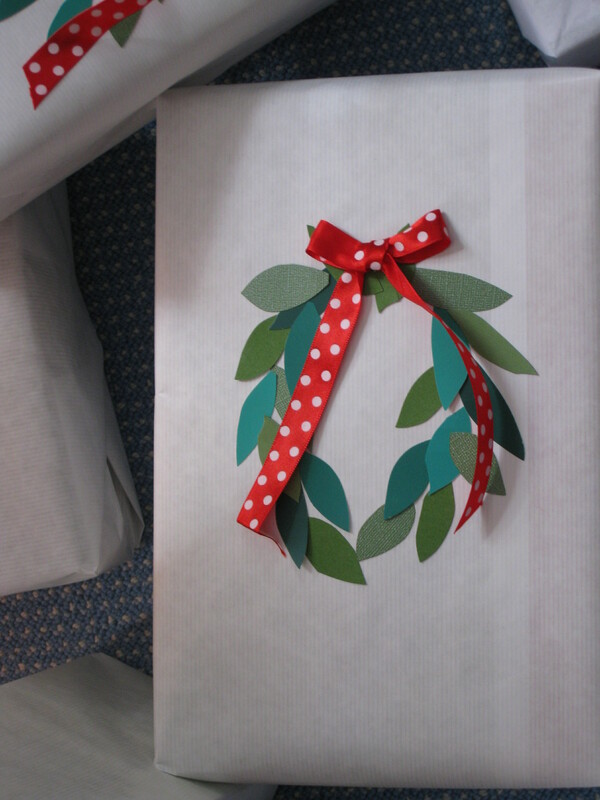 For this festive wreath, I started with big rolls of white kraft paper. You get yards and yards for only a few dollars. 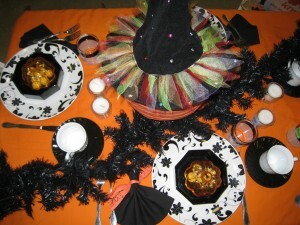 Then select scrapbook papers in a variety of greens. Some with sparkle, others with a matte finish. Mix up the shades. The turquoise next to olive green gives the wreath texture and a retro look. Cut out leaves. If you’re not ready for free-hand cutting, make a few leaf templates out of card stock and trace on the back of your green papers. You don’t have to be perfect, this is art. I always wrap all the presents first. I re-use old Christmas cards as gift tags and tape them to the bottom of the box. A couple of glue sticks and some Christmas music and you’re ready to go. 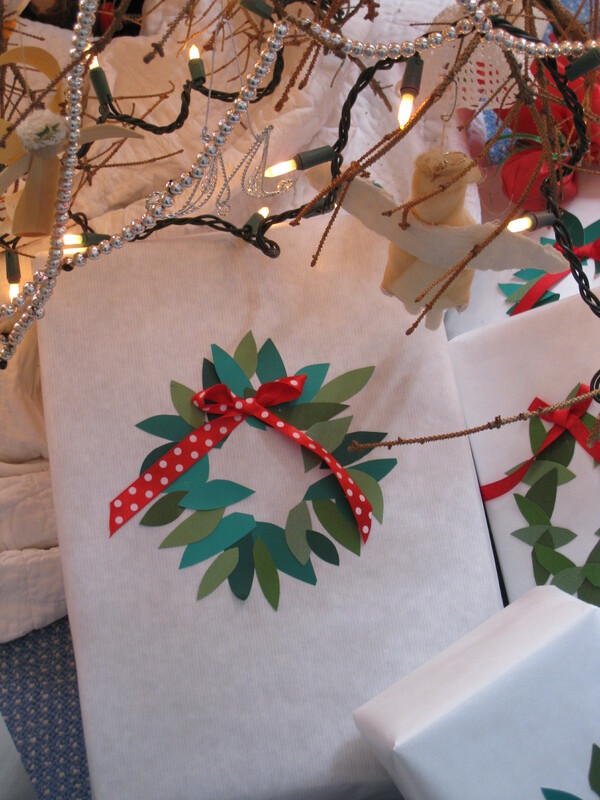 Make each wreath fit the size of the package, overlapping as you go around. Don’t glue down the whole leaf. Leave some of the ends loose for depth. 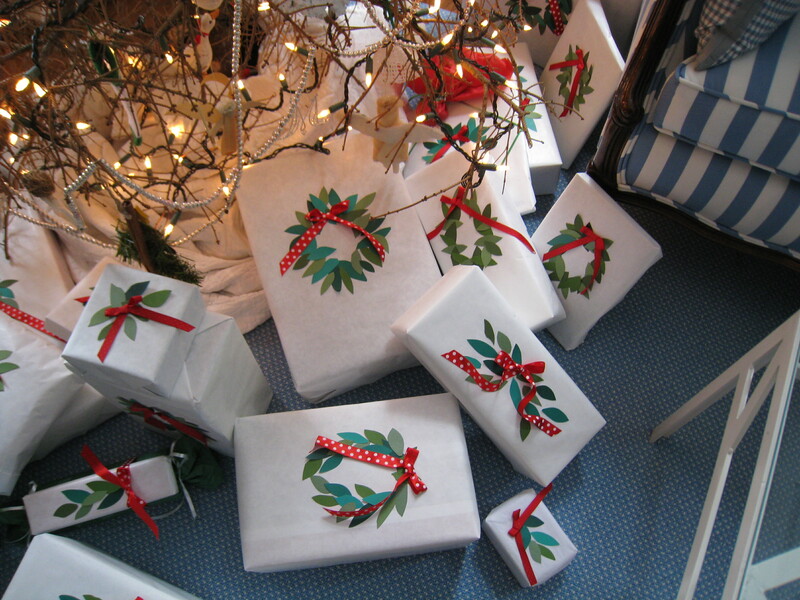 For small boxes, try a garland pattern. A simple bow out of colorful ribbon (who doesn’t love polka dots?) and you’re finished. Your wrapping session might take longer than usual, but the pile of presents under the tree sure looks festive and beautiful. Ever since my kids were little, I spent an afternoon wrapping while they were still in school. I had a roaring fire going and a favorite Christmas movie on DVD and wrapped all by myself. It was wonderful. Now that my kids are grown, maybe this year I’ll have a glass of wine while I wrap too. Mary These are so beautiful!